In the summer of 2013, we cycled across Canada, beginning at Mile 0 of the Trans Canada Highway and ending in St. John’s, Newfoundland. This was our first cycle trip of any significant length. We had talked about crossing Canada by bike for some time and, now that Paul had retired from full-time work, we had the freedom to take several months to do it. It was a leisurely trip, with stops to visit friends along the way and explore parts of Canada from a slower perspective. We loved the trip and have been hooked on cycle-touring ever since! As we travelled across the country, we endeavoured to acknowledge First Nations’ traditional territories that we were crossing. 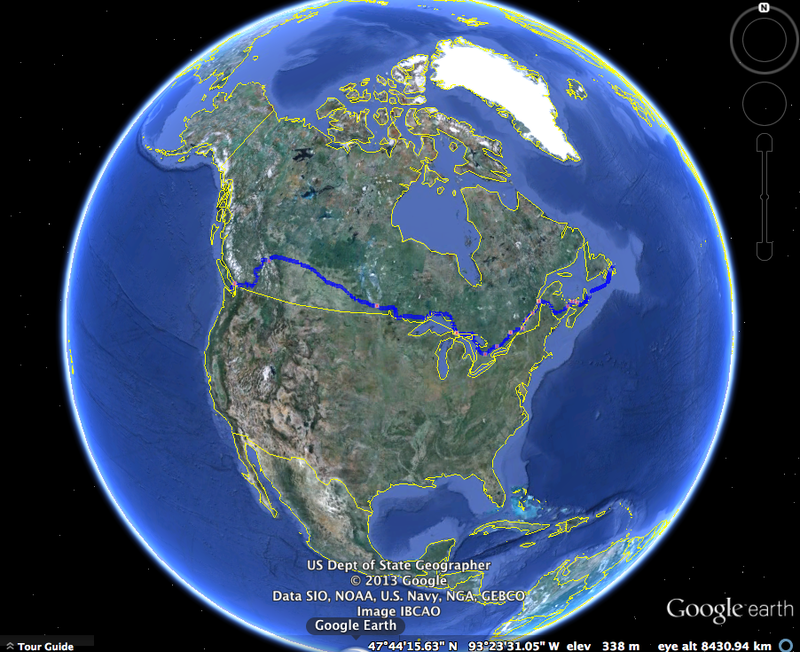 You can follow our preparations and progress through posts on our Cycling Across Canada Blog. remember to pay attention to sunburn on the side of your body facing south! I did a bike ride around Scotland many years ago – much shorter, and still ended up with a uni-tan. How exciting, looking forward to tracking your journey. Be safe & may you always be dry & warm. Have a great time. Why didn’t you cycle (with pontoons attached to your bikes of course ) to our place as you started your trip? Good luck and cycle (swim?) past our place on your return trip,. I guess you sleep pretty well at night huh? It is great to have the blog. We are following you with great interest Are you making your 50 k goal? Hope the weather is kind to you. Thank heavens for the sanctuary of little bakeries. We miss you. Lois and Paul — We’re green with envy back here in Ottawa. Indeed, a bit strange to think you’re cycling TOWARDS central Canada…. Love the photos and the text — together they paint a rich picture of your adventure. Stay safe! John, Julie, Will and Adele.